If you think of whiskey, Jim Beam and Makers Mark are the two brands that you might have looked for. Jim Beam and Makers Mark are the two famous whiskey brands that have years of reputation in the whiskey market. Well, though these two brands come top among the whiskey brands, there are noticeable differences between the two. First of all, let us talk about Jim Beam. Distilled for several generations, Jim Beam was founded in 1795. The Jim Beam distillery started functioning in the hills of Kentucky. The name ‘Jim Beam’ was given in 1933, after Colonel James B Beam, who rebuilt the business after the Prohibition. Maker’s Mark is a hand made bourbon whiskey, which is distilled in Loretto, Kentucky. It has been on the market since 1953. Bill Samuels Senior, a sixth generation distiller of the Samuel family, in 1953, replaced the family’s 170-year-old bourbon recipe with a new formula. The first bottle of Maker’s Mark came out in 1958, with a dipped red wax seal. One of the differences that can be seen is that while Marker’s Mark has come up with a new formula to make bourbon, Jim Beam still sticks to the age-old formula. The Maker’s Mark bottles with wax dipped seals are more attractive than Jim Beam’s bottles. It is the dip marks that make Maker’s Mark unique from other bourbons. 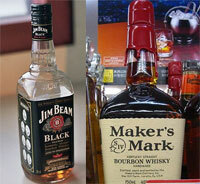 Moreover, Maker’s Mark comes in square bottles, unlike Jim Beam. It has also been said that Maker’s Mark only produces fewer barrels a day than Jim Beam. This means that the Maker’s Mark output is low when compared to Jim Beam’s output. 1. Jim Beam was founded in 1795, and started functioning in the hills of Kentucky. Maker’s Mark is distilled in Loretto, Kentucky, and has been on the market since 1953. 2. The name ‘Jim Beam’ was given in 1933, after Colonel James B Beam, who rebuilt the business after the Prohibition. It was Bill Samuels Senior, a sixth generation distiller of the Samuel family, who came up with the first bottle of Maker’s Mark in 1958. 3. While Marker’s Mark has come up with a new formula, Jim Beam still sticks to the age-old formula. 4. The dip marks on the Maker’s Mark bottles make them unique compared to the Jim Beam bottles. 5. The Maker’s Mark output is low when compared to Jim Beam’s output. Prabhat S. "Difference Between Jim beam and Makers mark." DifferenceBetween.net. April 29, 2010 < http://www.differencebetween.net/object/difference-between-jim-beam-and-makers-mark/ >. I drink both. Jim Beam when I don’t have much money, Jim Beam Black when I have a little more. When I can afford it, Maker’s Mark is just a better tasting bourbon to me. My palate is starting to discern the differences between corn/rye/wheat ratios and I just prefer Maker’s. As for higher rye, I prefer Wild Turkey 101. I drink them all neat. Well said, I believe you are correct and my taste sounds identical to yours. Next try for me will be Buffalo Trace. Have you had it? Just bought and tried Buffalo Trace a few days ago and it’s delicious. BT has a full, complex flavor, perhaps not quite as sweet as Maker’s Mark, but definitely as pleasant. I drink bourbon (Scotch, too) over ice and pour it about 20 minutes before drinking. After 20 minutes, the ice melts enough to create a perfect drink for the next 20 to 30 minutes. Maker’s is the reason I started drinking Bourbon instead of scotch. I agree with Dean that Jim Bean is cheeper, but also softer. Jack Daniels is In the midle for me. Maker’s Mark is a tad bit harsh to me…Jim Beam has a smoother taste!!! But they are both fine bourbons!!! But I prefer JB!!! Hi. I drink all three brands. After 3 generous shoots of Jim Beam/ Jack Daniels/ or Makers Mark I am unable to distinguish any of them. There all good!! !